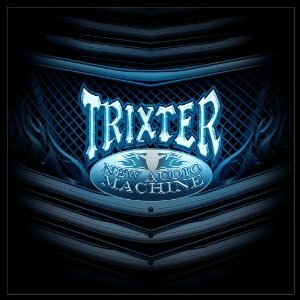 Hall of the Mountain King: Review: Trixter, "New Audio Machine"
If there’s one thing I should have learned by now in all my years of commenting on music as an amateur and professional, it’s this: Be sure you’re right before you make a smartass comment or you may end up eating it. Can someone pass me the salt and pepper? When I saw a new Trixter release on my list of upcoming records, I snarked offhand at Something Else Reviews. I thought I was about as safe as I could be. Unlike a lot of bands of the era, I never liked Trixter. I heard their self-titled debut in 1990 and thought it was just another generic entry into a rapidly devolving hard rock scene. I’m pretty sure I didn’t even know they released a second album until I read the press info accompanying New Audio Machine. Given my history, or lack thereof, with the band, I’m not even sure what prompted me to listen to the audio samples on the Frontiers Records promo download page. I thought it would be just for giggles. I clicked on the song “Dirty Love,” which sounded like the most generic 1980s glam rock title on the tracklist. About three and a half minutes later, I clicked on it again. Then a third time. Make no mistake, this song is pulled straight from the 1980s. Unlike some of the other bands who are trying to recapture past glory, though, this sounds like a song written and released in the time period. It doesn’t come off like a retread trying to appeal to old geezers like me who grew up back then. There’s a great energy, and the tune is catchy in every way. It immediately sent me back in time about 20-something years, and I was jamming along despite myself. From there, I moved on to “Get On It,” and its slinky, grooving guitar riffs. The gang-vocal chorus on that one wasn’t quite as memorable as “Dirty Love,” but the groove made up the difference. Up next was “Ride,” which opened with a very Bon Jovi-like rising vocal harmony, something that wouldn’t have been at all out of place on, say, Slippery When Wet or New Jersey. Once that song was over, I decided I had to download it and bite the bullet. What I found was, not surprisingly, a mixed bag. There are definite duds here. “Physical Attraction” and “Walk With a Stranger” are limp rockers without a lot of feeling, and ballads “Live for the Day” and “The Coolest Thing” are pretty generic to the style. But overall, it’s far more good than bad. The twangy blues-rock acoustic intro to album opener “Drag Me Down” is tasty, even if it does seem an attempt to recreate “Give it to Me Good,” the biggest hit from that self-titled record. The driving bass line of “Machine” lends it a cool factor, and the AC/DC-inspired main riff of “Save Your Soul” might be the most genuine hard-rock moment on the record. Even the lead single “Tattoos & Misery” has a certain air about it, delivering a 1990s alternative rock feel on the verse and a catchy, pure 1980s chorus — though it reminds me of Sleeze Beez’ “Stranger than Paradise” (the only song I like or remember by another obscure 1980s band). Aside from those catchy songs, I like New Audio Machine because there’s no pretense. Trixter isn’t trying to boldly re-imagine the 1980s glam-rock scene, and they’re not trying to make themselves relevant to the current radio climate. They’re honest about what they are and make no apologies for it. The record ends up being more akin to a time capsule. If you’re a child of the era, it’s pretty easy to crank it up, close your eyes and send yourself back to a time before bosses, bills and the burdens of being a responsible adult — at least for a few minutes. I think we all need that sometimes.